Meet Ms. Jo, the talented lead pre-kindergarten teacher at The Children’s Courtyard on West Glade Rd. in Grapevine, TX. 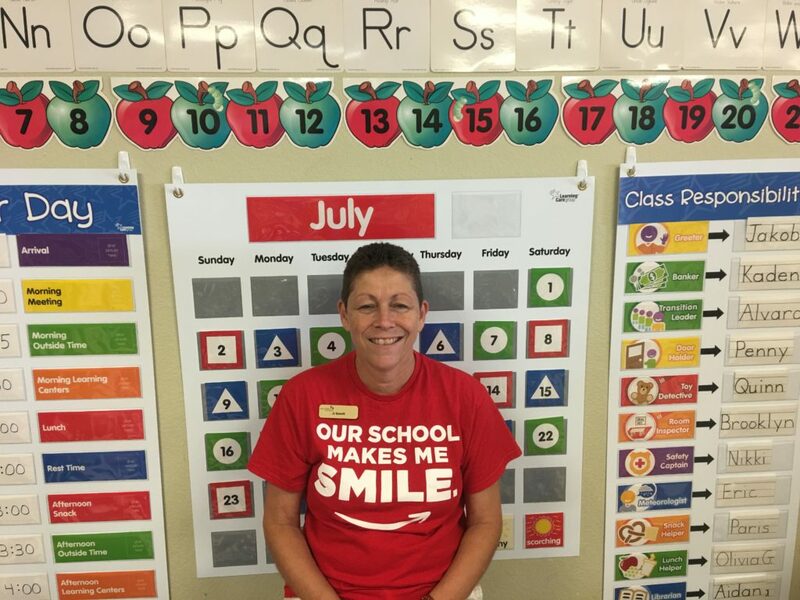 She has been at this location for seven years, but has been working with kids in early education for more than 20 years! Read on to learn more about Ms. Jo! Can you share some more about your background? I have an associate’s degree in child development and my bachelor’s degree in elementary and early childhood education. I started out teaching in 1981 and then I worked at La Petite Academy (one of our sister schools) in 1985. I was promoted to a director in 1986 and was a director for 13.5 years. Then I got out of child care and went to work for the Walt Disney Company, I actually moved from Texas to Florida. I worked for Disney and actually retired from them in 2009. I missed the kids! So I got back into child care through working as a nanny when I came here to Texas. I did that for seven months and then I said I needed to get into a school. So I found The Children’s Courtyard. I was hired as a master teacher at one of our locations in Austin, and then I came to this school to be a school-age manager. After a couple years, I really missed being in a class, so I became a pre-k teacher and I’ve been doing that for about 4 years. Why did you choose a career in early childhood education? When I was young my parents owned a daycare center. I was a really good babysitter in our neighborhood, and I started loving children by babysitting, so I was hired for a little afternoon job after school when I was 16 and then after that, I decided I really wanted to get into early education. There’s definitely a self-reward you get. It has to be your drive in life. In what ways is teaching rewarding to you? The students are just little sponges, they want to learn so much, and there’s so much you can teach. That satisfaction you get in seeing them progress through that year is rewarding. When we have a family that starts very young, you get to know them as a baby, you really get to see how they progress. They reach these milestones. I always tell parents that it’s a great feeling as a teacher to see how the kids have met their milestones. That makes it rewarding for you. The students are going to learn curriculum, they’re going to learn all the educational things they need to. And I’m strict. They’re learning behavior as well, and I’m really getting them ready for school. I had a talk the other day about how they’re going on from here and starting big school, and that everything they learned here they have to remember. What are some important lessons you teach? I have something unique in my class. When I was a master teacher, I got this little frog from one of the kids and the frog is holding onto a heart. I brought it in and I thought, “I’m going to try to incorporate this into my ‘acts of kindness’ lesson.” I took pom poms and I put them into another little container. Every time one of the kids did an act of kindness, they got to pick a pom pom and put it in the frog’s heart. The frog’s name is Kylie – it’s Kylie the Kindness Frog. When they empty the bowl and Kylie has all that kindness in her heart, we have an” Acts of Kindness” party. They look so forward to that. Can you share one of your favorite accomplishments since you’ve been at The Children’s Courtyard? I think just being a really good teacher and being able to get the kids to read. That’s a big accomplishment. When you get to the end of the year and when you see kids reading a book, and you think, “I can remember when they didn’t even know the first letter of the book,” that is an accomplishment. Do you have a memorable moment you’d like to share? The first year I was teaching pre-k, a family had an end of the year party at their house. I knew the parent very well and she said, “Do you want to come? We’re just going to have a little party for the kids!” And I said, “Oh that’s great, I’ll come!” I came to the party and it was actually a surprise end of the yea party for me, as well. You wouldn’t believe it! I had a beautiful bouquet of flowers, they gave me gift cards. That was a real memorable moment! Just the fact that these parents and the kids were so happy for me to be there. That’s always a really good feeling.